After selling around 200 combs in their first months in 2011, Chicago Combs sold almost 1,100 combs in 2012. The goal is to sell 5,000 combs this year. 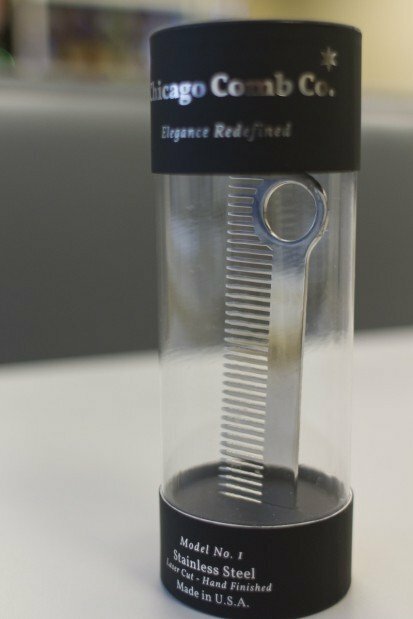 Competing with the small plastic comb that can be found for $3 at a drug store, Chicago Comb's niche customer base has no problem with paying a premium amount for this non-disposable steel comb. Chicago Combs' founders Ted Strom and John Litwinski were inspired by the modern tech design of companies like Apple. Not all of today’s new business ideas are high-tech. 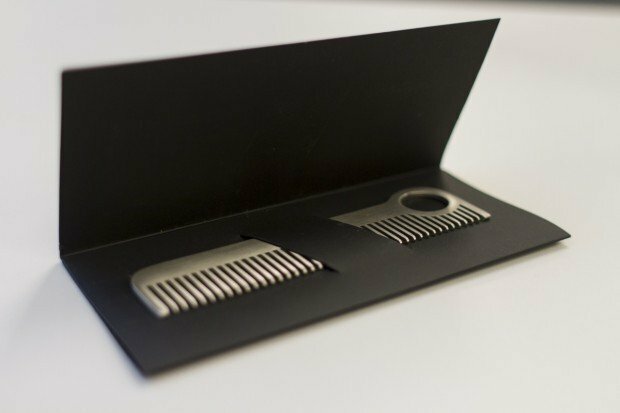 At first glance, a company that makes only combs might seem as low-tech as it gets. But behind the simple stainless steel design of Chicago Comb Co.’s “Model No. 1” is an advanced laser cutting system, sales boosted by digital word-of-mouth, and two entrepreneurs inspired by the design of modern tech. The company’s founders, Tedd Strom and John Litwinski, have always loved high-end design, but they also feel connected to manufacturing values that have gone by the wayside—longevity, sturdiness and products made locally from local materials. Their desire to create their own made-in-Chicago product culminated in 2011 with the creation of Chicago Combs first rigid steel straight-toothed comb. And customers are responding. After selling around 200 combs in the last few months of 2011, Chicago Combs went on to sell more than five times as many in 2012, with a burst of sales during the holiday season bringing the total to nearly 1,100 sold. The company’s goal in 2013 is to sell 5,000 combs, which is realistic given the performance so far this year, according to Strom. The small plastic comb—the competition—is priced at around three dollars, less than a tenth of their comb’s price. Despite the price difference, Strom and Litwinski are enjoying sales growth thanks to a customer base that has no problem paying for very re-usable product. Brittany Jones, who ordered a monogrammed brushed-finish comb directly from Chicago Comb’s website as a Hanukkah present for her boyfriend, was drawn by the “sleekness” of the steel, and how well the comb matched the 30-year-old recipient’s style. But Jones, who lives in Los Angeles, sees the price as a little high for most people to buy for themselves. “He had mentioned the comb and said he couldn’t justify spending that much. But I could justify spending that much, for a holiday gift,” she says. Having developed a comb with great appeal to a very narrow section of the population, the partners have to face the problem: Once customers have non-disposal combs, how will Litwinski and Strom grow their business big enough to quit their jobs as a lawyer and senior manager, respectively, and pursue Chicago Comb Co. full time? The answer may lie in the comb’s lack of competition and singular design. Like many one-of-a-kind products, Chicago Combs have a stylish cachet of a budding luxury brand. “The comb doesn’t have to be such a disposable item, like a toothbrush,” he adds. The appeal for the two partners, friends since junior high school in Downers Grove, was to use not only a very long-lasting material, but a material sourced from the local region. All Chicago Comb Co. combs are made from U.S. stainless steel located by their manufacturing partner, Humboldt Park’s Triton Industries Inc. Triton makes every effort to buy material from local sources, including most of their cold-rolled steel from Indiana mills; the stainless steel for the combs comes from Kentucky. “We’ve always been really interested in manufacturing and doing it locally, but also really loved well-designed products,” Litwinski explains. One potential for growth is expanding the product line beyond this first grooming tool, which Strom and Litwinski plan to do this year. A finer-toothed comb in the same design is one option on the table, as well as a smaller beard and mustache comb designed to be more precise. Triton Industries cuts the combs from a sheet of standard 304-grade stainless steel with a thickness of about one-tenth of an inch. An industrial laser follows a program to automatically zip through the steel, cutting the combs’ basic shapes. From there, the sharp edges are smoothed and a finish applied at Clybourn Metal Finishing, a process that is done by hand on manual grinders and buffing wheels. Along with custom packaging from Chicago Paper Tube and Can Co., Strom says the cost of manufacturing adds up, though it reflects 20 percent to 25 percent of the retail cost of the comb, a figure Strom describes as comparable with similar quality products. Strom and Litwinski say they are constantly looking for new retailers to grow their sales. Merz Apothecary, with locations in Lincoln Square and the Loop, has been the company’s biggest-selling retailer, but the combs are sold in stores all over the U.S., from North Carolina to Kansas to California, as well as through various outlets online. Steven DiRamio, who lives in Duxbury, Massachusetts, says he saw the product on the Kickstarter website earlier this year. DiRamio says he’s attracted to the durability of the comb: “You’d never have to buy a comb ever again, and it’s cool,” he says. But he is holding out for the company’s upcoming beard and moustache comb, since he shaves his head but grows his facial hair out once a year for “Movember,” a men’s health awareness event. Litwinski says he believes the company’s product appeals equally to men and women, but that women are often purchasing the comb as a gift for a man. Comb sales have also been supported by the movement toward locally-made products. The “local-conscious” movement supports limiting the use of fossil fuels used in transportation of materials, and focuses on manufacturing employees being paid a fair wage. Litwinski thinks men are increasingly willing to spend more on style and grooming products. He noted that his company’s combs cost “about as much as a haircut or two” at some of the higher-end men’s salons in Chicago.